Does your cash drawer open when you use a gift card? It doesn’t have to! Under the Cash Drawer options in System Setup | Cash Drawer, you can select to have the drawer stay closed when a gift or credit card is used. This allows you to limit employee access to the physical cash drawer. There is big push in a lot of areas to implement pole displays for customer protection. The thought is that customers will be safe from being ripped off by seeing the correct price. After my trip to Disneyland, I’m thinking more and more that we need to think about using pole displays or customer confirmation terminals and receipt printers for protection against employer theft as well. For example, twice while in Disneyland, I bought product from a street vendor and had them ask if we would like a receipt. When the answer was no , they took cash and never used the register! Unfortunately, this is a pretty common scenario with locations where there is only one employee working during that shift. A good POS with a pole display and automatic receipt printer helps stop that. The employee knows that the customer is watching what is happening. Add a cash drawer that will not allow the next transaction to be rang up until the drawer and closed and you can be pretty sure you are doing everything possible to prevent theft. Add a low tech sign telling customers to expect a receipt to be offered and you are doing better. You have a spare don’t you? Have you looked into spare equipment for your POS system? This blog is for those of you that are running systems that have seen better days. All of us try to push the envelope when it comes to equipment. I rarely have a customer that calls us up after 3 years and says that they want to replace the computers pro-actively! If your stations are 3, 4, 5 or more years old, then you might want to think about a spare computer. You have extra product on hand right? A spare tire in the car? A spare house key or car key? It makes sense to have a spare computer for one of the most mission critical pieces of equipment in the store! Recently, we had a customer running a two terminal system with eight year old computers . . . on a Wednesday, his main computer died. Sure, he was still up on station two but it severely impacted the business while he waited to buy a new computer and have it arrive and configured. 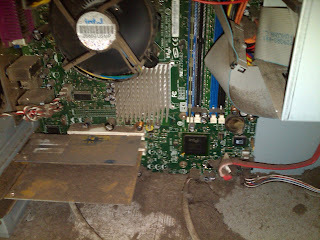 If he had a spare, he would have been up and running immediately! So, if your computer looks like the one below – call us and ask about options for spare equipment! Every day here at SelbySoft, we receive calls asking about shortages in the cash drawer. While a number of these are simple mistakes by the crew, theft is an issue as well. If we can make our cash handling employees accountable for the mistakes and shortages, then we are on our way to eliminating them. So, the question is how can we help? It all starts by deciding who has access to cash in drawers and how we can minimize that. Do you allow anyone in the store to handle the cash? Do you have a dedicated cashier that must ring up every order? Do you have a couple people that you trust? All of the above work but only if handled properly. The basic problem in most stores is that there are just too many hands in the drawer. Then, when the drawer is short – who do you look at? First, we lock down the cash drawer. In SP-1 you can assign a cash drawer to an employee. This helps insure employee accountability because only that employee can access the cash. Set your system to allow anyone to start a ticket but only the approved employee code to close out a ticket. This provides you with the flexibility of having every employee being able to start an order (and then place it on hold) but only having one employee cash that customer out. Use multiple cash drawers. SP-1 allows up to five cash drawers per station! With this, you are actually assigning 1-5 employees to their own drawers. If employee one takes an order, drawer one opens, employee two takes an order and drawer two opens. With either method, you will be on your way to eliminating the potential for shortages in your drawer and increasing employee accountability. We are back from the SCAA show in Anaheim! It was a great show and a good time catching up with customers and new clients. While down there, we had a number of people ask us about the Barista / Kitchen monitor systems. It seems that dropped paper, lost and greasy slips are causing people to say enough and to start looking for a different solution. The monitors work by being placed in a spot that is easy to see and visible to the person making the order as well as the rest of the staff. An advantage with this is the fact that the monitor is visible by all and it helps the manger and owner keep an eye on how the make line / barista section of the location is doing. This helps eliminate bottlenecks and improves communication and flow in the store. Additionally, these monitors have the ability to time how long an order is taking. If an order hits the deadline then the time starts to flash! This gives an instant notification that the order is taking too long and also helps that staff member stay on top of things. These monitors can be arranged to show the orders in variety of ways. For instance, drinks on top, food on bottom; carry out on top, delivery on bottom and so on. I’m finally back on the blogs for each week . . . We are getting ready for two big shows that are coming up and have had some interest in showing off our Fingerprint ID Security System at these shows. One of the things that we have heard more about in the last year is the incidents of employee theft increasing. So what is a Fingerprint ID System and how does it work? These units are connected to the software and then either sit on the counter or attach to a monitor. They are designed to allow the employee to use any one of their fingers to both clock in to the system and to be used as an id for employee tracking. What this means to you is that you will have a complete piece of mind when dealing with your employees. For instance, you can reduce the incidents for employee time theft easily. So, when the employee wants to have a buddy clock in for him . . . can’t happen. But this works both ways. . . If you assign employees to cash drawers (future blog topic? ), then the fingerprint helps that employee feel secure. Let’s play this out. . .
Bob is assigned to a cash drawer – he is the only person that should be handling the money at the counter. Now, Bob walks away and Susie knows his four digit code. She enters that, hits no sale and pockets the cash. Bob get’s blamed. So, what if we use the employee swipe card instead? Same scenario. . .
Susie walks up, grabs the card Bob left behind, swipes it and steals the money. Bob get’s blamed. Finally, let’s play this out with a fingerprint. . .
Susie walks up and . . . Nothing – she can’t open the drawer. Bob is secure in knowing that the cash in the drawer is his responsibility and that it is accurate. So, if you have a fingerprint through us – use it! If not, call us and ask how we can implement it in your location. Let’s talk about a couple things that are optional (they require a hardware purchase) but that can help you in very significant ways! First, what are they? A Pole Display is something we have all seen – it’s a simple display with 2-4 lines mounted on a pole and faces the customer. When items are entered into the POS, the pole displays that total price to the customer. Sometimes these allow for a message to display when the display is not being used. Order Confirmation Monitors are the next evolution in this technology. They are a full screen (usually 15-17″) that sits on the counter and provides a full description, price as well as customized messages and pictures that display to the customer. Basically, this provides a more full featured method of showing the customer what they ordered. So, why have them at all? Well, for a number of reasons. . . First and foremost is the perceived value as to employee theft and customer satisfaction. It’s hard for an employee to back out of a ticket, void it or change an item and then pocket the money when the customer sees everything that is being done. Aside from employee theft, the OCM (Order Confirmation Monitor) has other advantages. 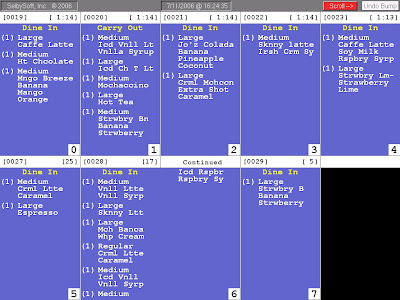 Because it is a full monitor this system can display upsell options and even a slide show that displays when the customer is waiting for their order. These options allow you to market directly to your customer as they are ordering. Would you like your computers to last? Silly question I know but many of our customers never bother to take care of the equipment! Backups – Get an internet connection and sign up to have your data backed up online through SelbySoft! It’s FREE if you are on a support plan! Call us for more details about how to do this! Computers – Usually there are either thumb screws or regular screws holding the case on. Two screws and the top of the case slides off. A can of compressed air is a godsend to computers! Just spray it out – take care to hit all the fans (but be careful to not spin the fans so much that they whine). These fans are the most important part to keep clean – they control the heat in the system. While you are at it, open the cd or dvd rom and hit it with a quick burst of air! Printers – Think about it, your printers are incredibly important. They are also very easy to clean. Pull the paper out, leave the lid open and gently shake it while upside down. Then blow any paper out that you can. Check for bits of paper stuck under the cutter etc. Finally DON’T use anything but authorized ribbons! They really can damage the printer. Monitors – Touch screens are pretty simple. The biggest thing is to check the cables periodically and make sure the cables are tight. Clean the screen by spraying non-abrasive cleaner (windex etc) on a towel and wipe them. Make sure that employees are not using pens or anything pointy to ring up orders. So, there you go. . . A few ways to extend the life of your system!